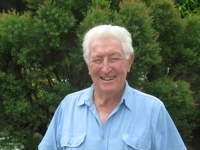 Russ Larkin Snr, was born and educated in Sydney, Australia and on leaving school at 15 , was apprenticed as a Fitter and Turner with the Sydney County Council. On completion of his apprenticeship and spending two years as a tradesman, he went to sea with the British firm Andrew Weir (Bank Line) as Junior Engineer. Eventually he joined Manners Navigation of Hong Kong where, after a number of years at sea, he passed the examination for a First Class Engineer’s Certificate of Competency for Steamship and Motorship in the UK, having studied for a brief period at Poplar Technical College, London. After being qualified he was promoted to Assistant Superintendent Engineer for the Company in Singapore before being transferred to Hong Kong head office. Afte a number of various positions in the industry including Managing Director of a shipping company with forty vessels, he started his own firm of Consulting Marine Engineers and Ship Surveyors in Brunei where he became the Non Exclusive Ship Surveyor for all of the major Ship Classification Societies. On retiring from Brunei and returning to Australia in January 1990, he registered Russ Larkin & Associates, Cairns as a firm of Consulting Marine Engineers and Ship Surveyors, where it operates to this day. In November 1996 he was Accredited as a Surveyor to Maritime Safety Queensland to inspect commercially vessels registered in Queensland. Russ has a working knowledge of both the Japanese and Malay languages.